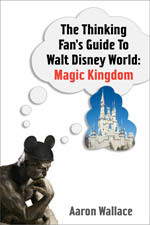 Periodically, I load up my car and head South on an 1,100-mile trip to Orlando, where I write guidebooks. I explain this odd behavior to myself in a number of ways: It’s a welcome break from the constant onslaught of the phone and email. It’s cheaper than flying and getting a rental car. It affords me a chance to be alone with my thoughts and mull things over. It gives me yet another chance to indulge myself at the Summerton Diner. But the real reason is probably that I’m just plain nuts.